Red light therapy, which opened the door to other types of light therapy, was first developed by NASA as part of experiments for space shuttle missions. Scientists noticed that astronauts exposed to the light healed faster than normal. NASA’s researchers were excited about this discovery, because it had previously been a problem that astronauts in space wouldn’t heal as fast as normal. It is this observation that led to further development and studies on LED red light therapy. In studies, red light therapy has been shown to greatly speed up cell healing and repair. Scientists do not know for sure how it works, but most believe it works by altering the energy that is available to the cell. It is possible that LLLT triggers an increase in cellular energy production. However, there is little consensus among scientists as to how does red light therapy work. The bottom line is, scientists just do not know for sure how red light therapy works. One thing scientists have noticed about red light therapy is that cytochrome c oxidase, an enzyme involved in cellular energy production, seems to accept a transfer of energy directly from the light. Some people are skeptical that some sort of light could have these effects. While I am a die-hard fan of healthy skepticism, a bit of research and logic easily shows that the effectiveness of red light therapy is not only possible- it’s probable. We already know, for instance, that the human body does react to light. In some cases, the light required to achieve these effects is very small. Consider, for example, that the body produces its own vitamin D when skin is exposed to sunlight. Or that the reaction of the retina to light exposure is how we have vision. Or that the reason we see in color is that our eyes react differently to various wavelengths of light. And there is no debate that the body reacts to lasers, which are made up of condensed light. So the idea that the skin, hair or other type of tissue might react to light is not as far-fetched as it may sound at first. You might ask: “if light or even certain colors of light have effects on the body, how come we didn’t know that before?” Well, lights were just to bright and too hot for anyone to get close to them without being burned. The invention of the light-emitting diode has allowed us to more fully examine how light affects us. An LED is capable of producing a bright, powerful light with little heat. This makes it possible to safely place the light closer to the skin (or other tissue) than was ever possible before. What is Red Light Therapy? Is It a Type of Laser Therapy? No. Red light therapy is not the same as laser treatment. What is confusing is that many people refer to red light therapy as “low level laser therapy” or “cold laser”. This is a misnomer. Both laser treatments and red light therapy (or other types of LLLT) use light. The difference is that laser light is “coherent”, meaning all its photons are synchronized. LED light is non-coherent. It does appear, though, that non-coherent light can have beneficial effects. Those effects and the question, “what is red light therapy?” are what this site is all about. What is Red Light Therapy Good For? Red light therapy– the use of diffused light in the wavelength range of 620 to 750 to cause changes in a living organism’s tissue- has been researched for many different uses. The research has steadily increased over the past few decades and now we have more information on which conditions red light therapy is good for (and which it is not). Often, you will see the term “light therapy” referring to the light boxes made to treat Seasonal Affective Disorder (SAD). SAD lights have gained popularity in mainstream medicine because doctors and scientists agree that they are effective. They are ultra bright lights that mimic sunlight, which is another type of light known to help people suffering from SAD. This helps a person with SAD regulate his or her circadian rhythm (known to be part of what causes SAD). What’s great about SAD lights is that not only do they help people who have SAD, they expose people to the idea of light therapy. 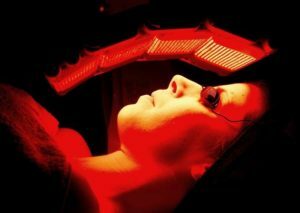 What Uses of Red Light Therapy are FDA Approved? Some of the most common types of light therapy you’ll find used are red light therapy, blue light therapy, and infrared light therapy (either near- or far-infrared). While there is some debate over which wavelength is best, it’s generally becoming clear that certain wavelengths are best for certain conditions. If you were thinking of trying light therapy, you would first want to decide what result you are trying to achieve. Then you would select the wavelength and type of light believed to be effective for that condition (based on the research available). Red and near-infrared light wavelengths can penetrate anywhere between one to six inches deep (scientists don’t agree on how deep). While scientists do not know for certain how light therapy works, there are theories. One popular view is that the light triggers the cell to make more energy (ATP) and increases DNA and RNA activity. Some believe that this beneficial energy effect only occurs if the cell is damaged. This idea makes sense because it is usually damaged or diseased cells that one is trying to treat. However, light therapy could also have benefits for healthy cells. Which Type of Light to Use: LED’s, Sunlight, Infrared, Etc. The type of light that is best depends on your condition and what effect you are trying to achieve. Sunlight is one type of light people use for light therapy. Sunlight may be chosen to increase vitamin D levels or improve fibromyalgia symptoms, for example. While sunlight can be very bright (and therefore very powerful), not everyone has access to full, bright sunlight year-round. When a more powerful light is needed, or when sunlight is not sufficiently available, another light source can be chosen. Usually, the choice is LED’s (light emitting diodes). LED’s are by far the most popular light source used for red light therapy and blue light therapy. There are many reasons for this, but the most important one is that LED’s are capable of producing extremely bright, powerful (and therefore effective) light. Despite being extremely bright, LED’s require little energy and do not get as hot as other types of lighting. So using LED’s can be practical and also save on energy and costs. LED’s, because they’re stronger, can get the same effects faster than other light sources. Other types of light can be used for different types of light therapy. For some conditions, these types are actually better than LED’s. An example might be using a halogen or fluorescent bulb. What about Halogen Lights for Light Therapy? Halogen lights put off light with a mixture of wavelengths. This “mix” is not that different from regular sunlight- it’s in the 600 to 900 nm range. This type of light can be effective and inexpensive, but it is not ideal for most applications. That is because the light it produces is not concentrated in the specific wavelengths known to be ideal/most effective. Halogen can still have beneficial effects, however. For instance, some users of halogen light claim it temporarily reduced pain and irritation from injury. At least one other claim I’ve seen is that exercising in front of a halogen light burned more calories. Red light therapy for pain is not a new idea- people have been using infrared light for quite some time. It was believed that the heat the lamp produced was what helped so much. Now it is known that near-infrared light plays a role in relieving pain. How Much Can Light Therapy Help Me? There are a lot of factors in determining how much light therapy might help you: your condition, power of light used, source of light and more. Light therapy is a very useful tool for some purposes, but it is not a magic cure-all. It is usually best used in addition to other treatments or therapies. For instance, if you are using light therapy to relieve pain, you might also apply ice and take an over-the-counter pain reliever. Light therapy should never be used as a substitute for professional medical care. If you are using red light therapy for acne, you’d probably get maximum benefit from using it in addition to other treatments, such as topical antioxidant or anti-acne creams. Results vary from person to person, but to give you an idea, some people say that after using light therapy for pain, their pain is reduced by 50-75%. The pain relief is temporary and usually lasts 4-6 hours. However, it is believed that using light therapy could help the injury actually heal faster. If you have pain or a potentially serious injury, be sure to seek medical advice first! What Wavelengths Should I Use? How Much Light Therapy Should I Do? When it comes to light therapy, more is not better. Doing light therapy treatments too much can cancel out the benefits you receive and depending on the type and source of light, it could also cause harm. For instance, in the case of sunlight or UV light therapy, more is not better. If you are using light therapy for a condition that causes pain, it’s advised that you use it only long enough to cause a reduction in pain. This helps ensure you don’t overuse it and only use it enough to get the optimal result. The pain relief experienced is usually temporary and you will have to treat the area again in a few hours if pain persists. However, light therapy treatments are likely to help reduce healing time. What’s difficult is determining how much light therapy is “too much”. That depends on the type of light source, the strength of the light, type of light, where the injury/condition is located on the body, etc. But because too much could cancel out the benefits you can get, it’s always best to err on the side of too little. There is some evidence that the more recent an injury, wrinkle or other problem is, the more light therapy will help. So if you have a choice, it may be best to begin using light therapy soon afterwards. But not too soon! If you’re treating an injury, it is best to let inflammation subside before doing red light therapy or other light therapies. 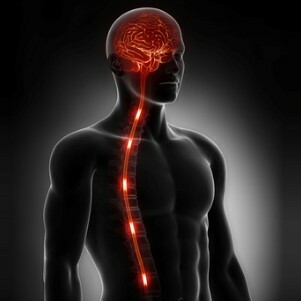 The reason is that red light therapy and most other light therapies increase blood flow to the region. If an area is already swollen and inflamed, more blood flow is not going to feel good and it is unlikely to help. Once inflammation goes down (if applicable), light therapy is often used multiple times in a day (for example, two to four times for 10 minutes each). However, in no case should you begin light therapy for a medical condition or potentially serious injury without first seeking professional medical advice. It would also be wise to discuss your case and how light therapy might be helpful with your doctor. How Deep Can Light Therapy Penetrate Through Skin? There is much debate over how deep light therapy devices can penetrate through the skin. This is an important matter, because if the light cannot penetrate deep enough into the body, it cannot help with problems occurring there. One thing that is generally accepted is that the power of a light source has a big impact on how far through the skin it can reach. Some argue that even very strong light therapy devices can only reach 1” to 1.5” deep through the skin. That implies that light therapy cannot work for anything that is deeper than that, such as a joint that is not on the surface. Others claim that light therapy devices can sometimes reach 3” to 6” through the body- even through the skull into the brain. LED-based, non-laser red light therapy is very safe for most people. The main concern with red light therapy is the brightness of the LED’s on the eyes. People with skin photosensitivity from conditions such as rosacea or from taking certain prescription medications could have skin irritation from the light. Some other people have conditions that bright light is known to affect, such as seizures, migraines or bipolar disorder. Below are some safety tips for using red light therapy. Read the manufacturer’s instructions and safety information before using the device. Do not stare into the bulb or device when it is switched on. As long as you do not have a medical condition affected by light, a very brief glance in the light’s direction might be okay, but honestly it’s a much better idea to play it safe. Avoid staring into the light source when it is on. This includes infrared LED’s, which emit light that is not visible. Always wear appropriate eye protection when using a red light therapy bulb or device. For non-laser, LED-based light therapy that is red light only, tanning goggles may be sufficient. To be on the safe side, I do not recommend directing the bulb/device towards unprotected eyes for prolonged periods of time, even if your eyes remain closed. Another option would be to choose goggles meant to block out all light. And if your red light therapy bulb or device includes infrared or blue LED’s, tanning goggles may not be sufficient. If you have any condition that could be affected by exposure to light, be sure to discuss red light therapy with your doctor before trying it. Examples of conditions that can be affected by light exposure include seizures/epilepsy or migraines that are triggered by light flashes. Other possibilities include medication side effects that cause photosensitivity and medical conditions where bright light exposure may have unusual effects, such as bipolar disorder. Some common skin care products can cause temporary photosensitivity, so you should not do your red light therapy treatments immediately after using them. Examples include vitamin C powder/cream/serum, retinol or lemon juice. If the product recommends avoiding light or sunlight for a period of time afer application, you should also avoid red light therapy treatments for that period. Many medications also cause sensitivity to light, either through the eyes or the skin. A full list of these medications is too long to list here, so you should check with your doctor or pharmacist before trying red light therapy if you take any type of medication. Some types of medications that can cause photosensitivity include anti-histamines, coal tar derivatives, psoralens, NSAID’s, tetracyclines and tricyclic antidepressants. Red light therapy treatments are very effective at reducing pain and inflammation. They also speed up the healing process. There are different types of red light therapy, such as those that use red or infrared light. Both are effective for pain relief and healing. The effect depends on the strength of the light, the length of time used and the type of tissue targeted (for example, skin or bone), among other factors. Red light therapy technically only refers to light therapy using purely red light. However, many people also use this term to describe infrared light therapy. Both types appear to be effective for relieving pain and accelerating healing. Some studies show a slight advantage to using infrared light therapy, while others show red light therapy to be somewhat advantageous. Many studies have established the red light therapy benefits (or of infrared or both). Some of them are discussed below. The pain relief effects are temporary and last anywhere from a few hours to a day, while the healing effects can be more permanent (depending on the injury or condition). Since red light therapy can speed up healing time, you may achieve a higher level of pain relief for longer periods as your body heals. Red light therapy can make an excellent addition to a pain management plan, provided your doctor approves. This makes it an ideal add-on treatment for many. Many studies have shown the effectiveness of red light therapy for pain relief for everything from post-workout soreness to pain from orthodontics. The U.S. Navy SEALs have reported that red light therapy treatments improved training-related injuries by 40% and that it decreased wound healing time among U.S. Navy submarine crew members. Red light therapy has been used in diverse treatment scenarios, including to reduce mouth and throat pain from chemotherapy-induced ulcers in children. In a NASA-related study, red light therapy treatments were used to reduce the incidence of mouth ulcers in young cancer patients. These ulcers, in addition to being very painful, complicate treatment by making it difficult or impossible for the child to eat. For children who still got ulcers, red light therapy reduced their pain by 39-48%. Curiously, red light therapy has been shown in at least one study to delay the onset of muscle fatigue, allowing study participants to lift 12 to 14.49% more weight. Overall, it’s clear that red light therapy is useful for pain relief. One of the most exciting things about LLLT– both red and infrared light therapy– is the evidence that it greatly speeds up the body’s own healing process. Scientists are not certain how LLLT does this, but they believe it speeds up healing through more than one mechanism of action. 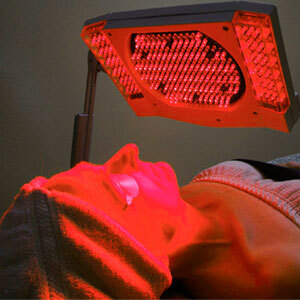 Firstly, red light therapy has been shown to increase the growth of cells. In a 2004 paper, researchers noted that it increased the growth of human epithelial cells 155-171%. It increased the growth of animal cells by up to 200%. In another study, red light therapy increased the growth of fibroblasts, cells that make collagen and other substances important in healing. This could partly explain why red light therapy is effective for speeding up healing. Another reason is that red light therapy has been shown to increase cytochrome c oxidase and upregulate genes responsible for energy production and antioxidants. Harvard Medical School professor Dr. Michael Hamblin says there are a few different ways red light therapy is thought to work. Increased ATP, or cellular energy, production; inducement of transcription factors; and effects on reactive oxygen species, he says, result in effects such as increased oxygenation of tissues, cell growth and migration and the regulation of cytokine levels, growth factors and mediators of inflammation. All of these are important to the body’s healing processes. Numerous studies have shown positive results for red light therapy and wound healing. For instance, a study in Photomedicine and Laser Surgery in 2009 found that red light therapy treatments with a combination of red and infrared light healed large, chronic ulcers 40% faster per month than controls. These ulcers had been resistant to other forms of treatment. Another study, published in Lasers in Surgery and Medicine, examined the treatment of leg ulcers in diabetic patients using a combination of red and infrared light therapy. After a month of twice-weekly treatments, ulcers had healed 79%.Participants who had received a fake placebo version of the treatment had ulcers that worsened over the same month. After three months, all ulcers in the red light therapy group had healed at least 90% (most had completely healed). In contrast, only one patient in the placebo group had an ulcer that healed completely in that time. The evidence points to the conclusion that LLLT is useful in healing wounds and injuries. Fortunately, there are a few treatments you can try for yourself, including LED light therapy or LLLT and near infrared light therapy. Near infrared treatments have shown some success. In a four week study at Brigham Young University, researchers found that exposing the legs to near infrared light gradually decreased RLS symptoms over the course of the study. Participants did three 30-minute sessions each week. Interestingly, even after the treatments were stopped, the decrease in symptoms remained one month later. The researchers also did another study comparing infrared devices to determine whether there was any difference in effectiveness. Despite the devices having different wavelengths, frequencies and one including red as well as infrared, the devices were deemed to be equally effective. Fortunately, trying near infrared therapy for RLS is relatively easy. There are near infrared bulbs and devices on the market which you can use at home. There are also doctors and clinics that can administer the treatment for you. Although the treatments are likely to be effective, you may have to be patient to see results. And obviously, you should discuss it with your doctor first before using near infrared therapy to treat your RLS. Gabapentin/Pregabalin – prescription alpha-2-delta ligand medications. Dopamine agonists – prescription medications such as pramipexole, rotigotine, ropinirole or cabergoline. Iron supplementation if you are deficient in iron. Using an LED light therapy/LLLT bulb is pretty easy. Simply take the bulb and screw it into a lamp or light fixture, the same way you would screw in a regular light bulb. I recommend a gooseneck clip lamp because it can be attached to an object and then adjusted easily (leaving your hands free). The best lamps are those with a plastic shade, which can be removed. Another solution is to use a lantern cord, which is a bulb socket on a long cord. This allows you to move the bulb around very easily, but the downside is that using it hands-free could be difficult. Turn on the lamp or light fixture you’re using and place the bulb directly on the skin. Some people prefer to keep the bulb very close to the skin instead and seem pleased with the results they get. Personally, though, I think it is best to have the bulb as close as possible to you. Since it is painless, I see no problem with doing it this way, except that for 5 to 10 minutes after a treatment, you are going to have little dimples in your skin where the LED’s were. To keep the bulb surface clean, you may cover it with a single layer of plastic wrap each time you use it. I think it is best to do this each time you use your bulb because cleaning the bulb is difficult. Keep the bulb on your skin for the duration of time recommended by the manufacturer. For most LLLT bulbs and devices, this will be anywhere from 5 to 30 minutes per session. The manufacturer should say how many sessions per day you should use. Typically, up to 3 sessions per day on the same area are recommended. Take care not to overuse your LLLT bulb. Not only will excess use produce no additional benefit, but it could even reverse the benefits you’ve gained for the day. More is NOT better when it comes to LLLT. Because it is a bulb, it cannot be immersed in water or any other liquid. You should also not spray water or any other liquid on the bulb. Therefore, preventing dust and dirt from accumulating on the bulb is important. For this, I recommend covering the bulb’s light emitting LED’s with a single layer of clear plastic wrap. Do not put plastic wrap on or around the metal part of the bulb that is screwed in. Change the plastic wrap on the bulb each time you use it, especially if you are using it for acne or wound healing. You can use a slightly damp cloth or Clorox/Lysol cleaning wipe to gently wipe clean the bulb housing. Make sure to remove the bulb from the socket before attempting to clean it. To keep dust off of the bulb, use a soft microfiber dusting cloth. Safety first! Read the instructions that come with the LLLT bulb before using it. You can also read more general safety tips here. While an LED light therapy/LLLT bulb may become warm during use, it should never feel hot or cause pain or discomfort of any sort. If the bulb becomes hot or causes discomfort, discontinue using it immediately and contact the manufacturer. The short answer is yes, red light therapy is effective in treating most cases of acne, especially when combined with blue light therapy. In a study published in the British Journal of Dermatology, combination red and blue light therapy produced a 76% improvement in acne pimples and inflammation after 12 weeks. Participants used light at 415 nm and 660 nm for 15 minutes each day. Scientists have known for some time now that certain wavelengths of blue light, when concentrated enough and applied in a particular way, kills bacteria. This is the basis for blue-light bacteria killing air filtration systems. The biggest problem with using blue light to kill bacteria is that the light must be extremely bright. Usually, any bulb that produces such bright light gets hot and would burn you if you tried to put your skin near it. The solution, then, is to use powerful light emitting diodes (LED’s). These produce very bright light without the heat, so your skin can get very close to the light source. There are many devices on the market that use blue light therapy to treat acne. Most of these devices are expensive. A much better option is an LED light therapy/LLLT bulb which is far less costly and can be used with any regular lamp. Photodynamic therapy is similar to low level laser/light therapy, except that it involves applying a chemical to the skin to make it more reactive to the light or laser treatment. Blue light is usually used for photodynamic therapy. The effects are about as good as those of Accutane (an anti-acne prescription medication). Photodynamic therapy treatments are believed to work by normalizing the sebaceous glands and by killing bacteria. Unfortunately, these treatments can be expensive and may not be gentle enough to use on sensitive skin, which many acne sufferers have. Red light therapy and blue light treatment are effective for most people when used correctly. It kills off the bacteria on the skin that is associated with acne, speeds up the healing of pimples and some cysts and increases the body’s ability to heal and regenerate scarred areas. Low level light therapy (LLLT) has many benefits for the skin. It uses non-laser light at specific wavelengths to achieve different effects. LLLT bulbs and devices use light-emitting diodes (LEDs) to produce light that is powerful enough to be effective, without becoming too hot for the skin. 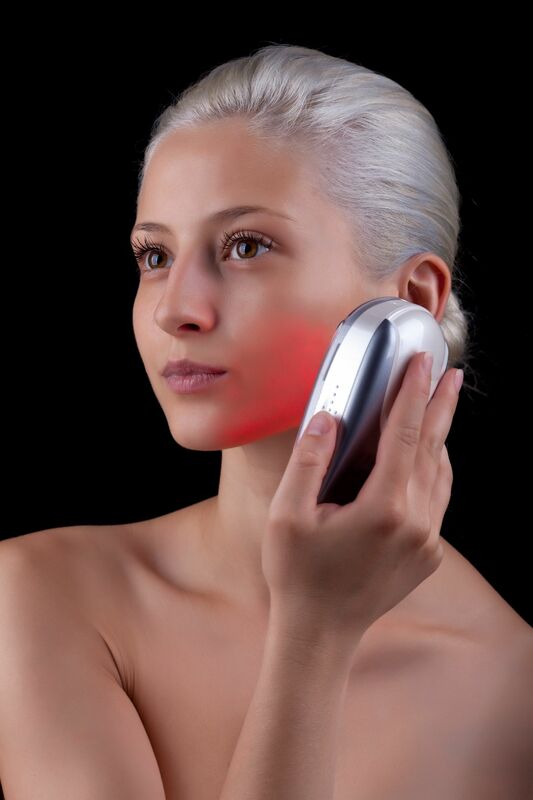 For acne, blue light is typically used, often in addition to red light therapy. Blue light kills bacteria, which is why it is used in some hospital HEPA filters and in dental tools. 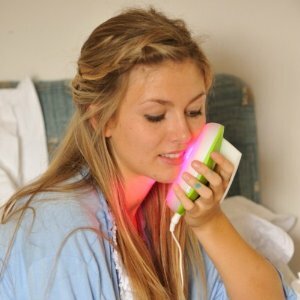 As an added benefit, blue light kills viruses, so it makes cold sores heal much faster. For most people with acne, blue light therapy is the most useful. Red light LLLT devices also produce benefits for acne-prone skin, but red light doesn’t kill bacteria. It increases the skin’s ability to heal itself, increasing circulation and stimulating immune response. For this reason, it is useful for healing skin wounds and relieving pain. If your acne is not entirely due to bacteria or you need wounds to heal faster, red light therapy might be more useful than blue for you. Another major category of LLLT is infrared light therapy. Near infrared light penetrates the skin deeper than red light and greatly reduces healing time. Infrared light isn’t visible, but it does produce warmth, so you can tell it’s there. If you have cystic acne, which is deeper under the skin than regular acne, near infrared light would be a good choice for you. It makes your body heal the cyst much faster, which often includes bringing it to a head so it can rupture and drain on its own before healing up. Infrared and red lights also ease any pain you may have in the area. Near infrared light also improves or heals scars. It strengthens the collagen in the skin, leading to less sagging, fewer wrinkles and improved appearance of scars. The only downside is, ladies, it’s going to make the hair grow faster wherever it’s exposed. While that’s fantastic if you’re pointing it at your hair, it’s not so fun when you’re pointing it at your face. You may have to wax, pluck, shave, etc. more often. All of these LLLT types- blue, red and infrared- can be used more than once per day. You could even use all three types to achieve maximum benefit if you like. With infrared light therapy, be sure to use proper eye protection to protect your retinas. Infrared light therapy is very safe, but staring into the light repeatedly could damage your retinas, which are fragile because they’re meant to absorb light. If you have any medical condition, it’s important to check with your doctor before using light therapy. While light therapy is very safe, it is quite powerful and some with medical conditions or those who are pregnant should err on the side of safety when it comes to using any new treatment.